Eddie Lee Mays had no idea how history would remember him. But the Harlem resident occupies a distinct place in corrections record books. On August 15, 1963, he was the last person put to death by New York state. By all accounts, Mays was a bad dude. He’d already served time for killing a man in North Carolina, his home state. 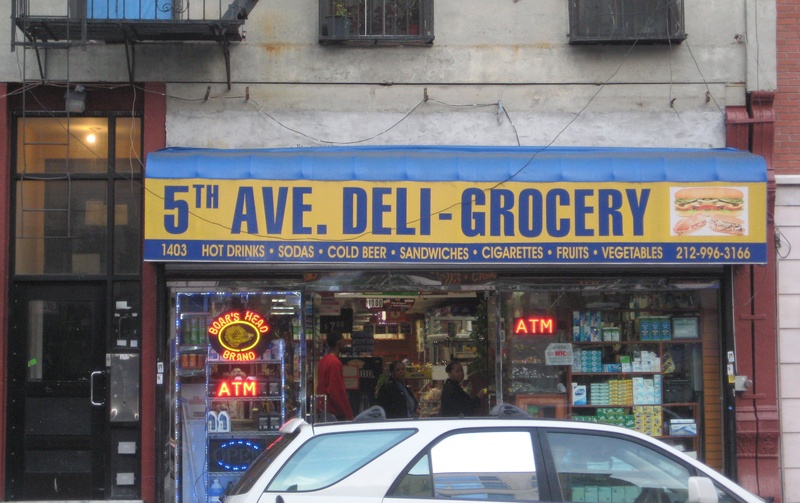 Some time after his release, the 32-year-old and two accomplices held up the Friendly Tavern, at 1403 Fifth Avenue in East Harlem (below, a bodega today), one early morning in March 1961. “[Mays] demanded that the patrons put their wallets and purses on the bar,” the Daily News recalled in a 1998 article. But a 31-year-old named Maria Marini was frozen in fear and didn’t move quickly enough. An enraged Mays pointed a gun to her temple and fired, killing her instantly. After his arrest, trial, and conviction for first-degree murder, “Mays had said he would rather ‘fry’ than spend his life in prison,” reported the Daily News. And that’s what happened in the death house at Sing Sing. He was the 695th person to be executed by the state since 1890. Two years later, the death penalty in New York was repealed. It was restored in the 1990s, then deemed unconstitutional in 2005, with no executions carried out and no one on death row to execute. This entry was posted on May 24, 2012 at 3:44 am and is filed under Bars and restaurants, Disasters and crimes, Upper Manhattan. You can follow any responses to this entry through the RSS 2.0 feed. You can leave a response, or trackback from your own site. I had no idea the death penalty was restored in New York State. And since the nineties there have been many monsters in NY deserving of it. What’s the point of if they don’t bother with it? SMH. Yikes, posted that too soon. The death penalty was found to be unconstitutional earlier this decade, so NY no longer has it. Sorry for the error. The last guy on death row had his sentence commuted, and there’s no one left there. Oh, thanks for the correction. I checked and it was declared that in 2004.
iirc it was re-instated by pataki, trying to show what a good law and order republican type he was, but part of the bill that re-instated the death penalty was to establish an office to defend all NYS death row prisoners (i read a profile of that attorney once), so there was a built-in brake. in any case, it’s gone now. Its the story of New York States most notorius inmate and his family. Best book I ever read. Mike believes the preposterous notion that the death penalty leads to an increase in crime. Truly absurd, but an indicator of just how nuts liberals are. The last 50 years have demonstrated beyond any debate that locking up criminals — or killing them — keeps them from re-offending, while coddling them and making excuses for their freely-chosen criminal acts leads to higher rates of violent crime. But deluded leftists like Mike persist in electing delusional leftists like de Blasio. And then they’re surprised when falling crime rates turn around and start climbing, just as NYC’s has been doing. Once called a preposterous notion floating, absurd nutty liberal, and deluded leftist by somebody who wants New York City to be more like 1950s Texas. It’s only the politicians that should be executed in NY!